Here is another sample of LDS Liberty. I think it captures their core tenets. Romney is a Socialist. He proved it with his record in Massachusetts. Romney supports the 2nd, 5th and 10th planks of the Communist Manifesto. The man is just another twin evil Republican. The USA is done for. Put a fork in it. The members are apostate because over 90% are practicing Socialists today. The member apostasy predicted in the Book of Mormon has been well underway. Members were repeatedly told they could not be faithful and socialists at the same time. They rejected this warning and have embraced the voluntary slavery of Socialist Security and Income taxes and paper money. Name a Mormon that does not voluntarily have a Socialist Security Number and voluntarily file and pay income taxes without even knowing the definition of the word “Dollar” or using the Religious Freedom Restoration Act to free himself/herself from voluntary slavery. Put a fork in the Elders of Israel. They don’t even read the Constitution let alone know how to save it. Romney will not change a thing. He was and will remain a Socialist and a puppet of the One Worlders just like most Mormons. Benson was right in Not Commanded in All Things. McKLay was right too. By this statement most so-called Priesthood holders have lost their priesthood and forfeited their right to the Celestial Glory. One of their popular mottoes - Disobedience to tyranny is obedience to God. 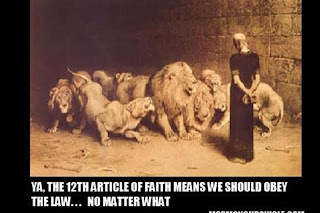 These guys are comparing their rebellion to Daniel in the Lion's Den. To think that I was arguing with one of them the other day about whether Mitt Romney was narcissistic.